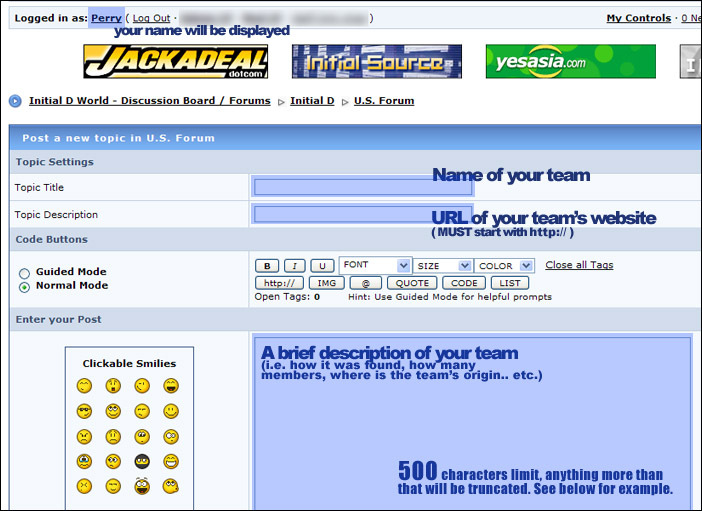 So what is this new Teams Forum? If you don't have a website for your team, you don't have to put anything in the description. You can always go back to edit your post later on. If you typed more than 500 characters in your first post in your thread, the post will be truncated for better viewing experience on iDA. The truncated version look like this. With a [+] Continued... link back to the forums. USA will probably be split into west/centra/east in the future. Any other questions/comments/concerns are welcome. Just a suggestion to people posting teams now, the first post should only be the description of the team as it will be limited to 500 characters. Anything else you want to include, ie: team roster or cards, can be posted on the second post. First post edited with screenshots. Hope it clarifies most of the confusion on how to start a topic. ^ So in the descripton do u put location,memebers, site etc.? And next post is members cards and all other crazy details? So i'm guessin it doesnt matter if your team is local or what not. Anyways this is a great idea. yeah, it doesn't matter what you want to put for your team information. But generally I think it is better to put a brief statement describing your team and all other info in a second post or on a website if you have it. You may share anything about your team with us as much as you care to. We are just suggesting you to put a brief description in the first post and in the second post you can put more stuff about the team and whatnot. Don't worry about double posting. If this isnt possible, I suggest some credentials just so any old n00b who can only beat Myogi isnt allowed to spam with their teams. 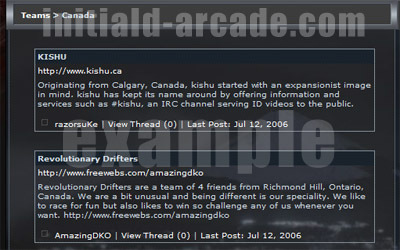 Wow, it's changed a lot from the old subforum. Very clean and I like the idea on the feeding to iDA. Hey my team can beat myogi, but usui is giving us problems lmao. Yea the more important teams should be stickyed. 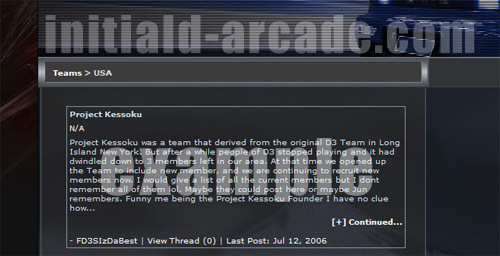 If you are talking about the old page on ida.com, YOU are gay, nothing on there was better than it is now. Hello I am Taisho Shirai, or Tai and I am the leader of the Shifting monkeys. A street racing team I have assembled that at the moment is composed of a weather specialist, uphill specialist, and a downhill specialist. We are all always open for challenges, so if your interested in racing anyone one of us please contact either me or Mac (SM), and we will see if we can work out a time in which we can all be at the arcade for this match. I can also be contacted on aim, my sn is Taisho Shirai. I would be the teams weather specialist, and I drive a black RX-8. Our uphill specialist is Mac who drives a black Silvia (s15). Our current location is Southern California and the arcade we race at is the Super Arcade. why don't you make a thread for your team? I would like to make a team that get the best time record in each home course! Such as 1 pair of teammate (one downhill one uphill) are the best in each course! So our team will have 12 course x 2 players = 24 players! But i wish to looking for northen malaysia players first! If already full 24 players! We will didt accept other player!